Some of the largest insurers are using end-to-end drone solutions, intelligence tools and detailed plans for deployment in order to get ahead of storms like Florence and streamline the claims process. Last year, when Hurricanes Harvey and Irma made landfall, we saw that drones offered a faster, more cost-effective method for addressing storm damage during a busy hurricane season. But insurance companies are innovating beyond that use for the 2018 hurricane season. Some of the largest insurers are using end-to-end drone solutions, intelligence tools and detailed plans for deployment in order to get ahead of storms like Florence and streamline the claims process. With Hurricane Florence making landfall in North Carolina last week, the 2018 hurricane season is in full swing. It’s already proving to be a costly one. CNBC reports that property damage and disruption is expected to range from $17 billion to $22 billion, ranking Florence among the top 10 costliest hurricanes. The death toll for the storm stands at 37, according to the Associated Press. Drones turned the claims process on its head in 2017. The traditional process of manual inspections involves an adjuster walking a property that’s in disarray, climbing the roof, inspecting only the accessible areas, marking damage and taking photos. But with drones, companies were able to simply prepare the flight, fly the drone autonomously to collect data, and then process it within minutes for digital inspection by the adjuster. They streamlined data collection, improved accuracy and eliminated the need for dangerous manual inspections. This year, companies are prepared to deploy drones after we witnessed drone operations on a major scale with Harvey and Irma. Harvey totaled $200 billion in damage, with upwards of 91 deaths. Irma racked up another $65 billion in damage, with at least 134 deaths. In the face of this extreme damage and loss, drones provided a faster claims process, improved safety during otherwise risky assessments and a reduction in loss adjustment expenses. This exemplifies why insurance is one of the top 5 industries expected to be revolutionized by unmanned aerial systems (UAS) the Federal Aviation Administration (FAA). “I don’t think it’s an exaggeration to say that the  hurricane response will be looked back upon as a landmark in the evolution of drone usage in this country,” commented former FAA Administrator Michael Huerta. Flying a UAS after a storm is a great way to address claims, but the process shouldn’t start there. Companies are now developing detailed plans for deployment of drones in regions that are likely to be impacted by hurricanes. This includes pre-staging drones with catastrophe response teams and getting staff properly trained and in place ahead of a disaster. We’re also seeing drones scaled across organizations. The best UAS packages offer fully autonomous drones that fly themselves and automatically capture data, so there’s no need for highly skilled pilots or manual joysticks. Companies taking advantage of this are developing plans with a project timeline that includes distinct pilot, integration and production phases. They’re also meeting regulations upfront with proper training and FAA Part 107 licensing. An autonomous drone flight on its own is not enough to gather and analyze data. Companies are also using artificial intelligence (AI) and machine learning (ML) tools to identify storm damage and speed up assessments. AI/ML software can automatically identify damage to roof shingles, so there’s no need for manual inspection and tagging, creating a much safer environment for employees. Particularly in the aftermath of a hurricane, there is a significant risk to climbing on roofs for inspection. Unlike typical conditions, roofs can be severely compromised from wind or tree damage. By using AI/ML tools to identify and analyze where the damage is without a person physically climbing on the roof, companies are saving on liability and injury costs. Most importantly, they’re keeping workers safe, while automatically gathering data with accuracy and confidence. End-to-end drone solutions that provide industry-specific data reporting and analysis on top of fully autonomous drone flights are being sought out by top insurance companies. These kinds of drone solutions prioritize cost reduction and streamline the assessment process by eliminating the need for third-party reports and service providers. For insurance companies, the priority has shifted towards utilizing drone software and systems that accelerate the workflow. When responding to the turmoil that storms can cause, they need to manage claims quickly so that property owners can rebuild as soon as possible. The ideal drone package should include an easy-to-use mobile flight planning app, and automatic data processing that can be shared immediately from the field to the office for analysis and claims assessment. Major storms like Florence are costly, and those affected can’t afford to waste time rebuilding. Drone solutions offer a way to streamline the claims process for insurance companies so rebuilding can start sooner. Leading companies are planning well in advance and using end-to-end UAS programs to lower costs, automatically identify damage and get storm victims back in their homes as soon as possible. “We believe our new drone program will help improve response time and safety for our claim representatives during their evaluations, and ensure Farmers maintains a leadership position in the insurance industry,” said Keith Daly, Chief Claims Officer at Farmers Insurance. Nathan Stump // Nathan Stump is the Director of Product Marketing at Kespry. 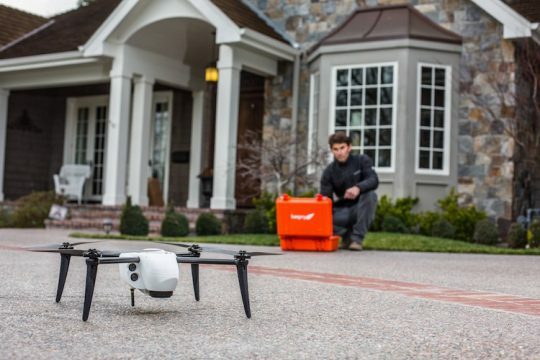 Located in Menlo Park, Calif., Stump ensures that the company’s insurance, aggregates, mining, and construction solutions align with industry requirements and deliver value to customers through Kespry’s drone-based analytics platform. Prior to joining Kespry in early 2017, Stump held senior marketing and strategy roles at Aconex and Autodesk.